Labor Day weekend 2001 was already upon us and summer was about over. Time for a little trip to a bluegrass festival. This was my first trip to Bass Mtn. in Snow Camp NC and it is a beautiful park. It's definitely out in the country, as a bluegrass festival should be. We thought the day was going to be a washout but the good Lord smiled and gave us a nice day after all. It was a little humid at times and it drizzled a little rain but, all in all, not bad. We arrived about an hour before any of the bands were to play and were greeted by the sounds of Patty Loveless' new bluegrass cd. Found a place reasonably close to the stage to set up our chairs then went around to check out the vendors and the park in general. County Record Sales from my neck of the woods Floyd, Virginia were there selling their CDs and other items. I got to visit with my friend Chet Rhodes who works for them. The music began at 1 p.m. with Southern Junction, a local bluegrass band. They were pretty awesome and said they were on a video that was in the Country Music Hall of Fame, which I though was pretty cool. I don't remember seeing it when we visited but then I kind of took the whirlwind tour too! Some guys I am proud to call my friends were next. The Lost and Found from around Rocky Mount Virginia. They are truly a talented bunch of guys and put on a great show. They finished up around 2:30. Marty and the Sullivans were scheduled to be on stage at 4 so we decided to visit the food vendors and walk around a little before settling back in. At four o'clock, the Sullivans and Marty hit the stage. For those of you who have never seen the Sullivans, they are a real treat!! Marty was playing mandolin and did lots of harmony singing. Jerry talked about how Marty was their angel by helping them get a record contract and get their music out to so many people. Marty lovingly refers to Jerry as "Uncle Jug" and it's obvious they all feel like family. They performed their hard driving gospel numbers one after another without missing a beat. I could try to give a list of songs they did but I honestly can't remember what they did on the first show and what they did on the second. After their performance, they came back for an encore and did "Workin' on the Building" which just left the crowd wanting more. We walked around behind stage to see what was happening and there surrounded by people was none other than Mr. Stuart. He was signing autographs and posing for pictures. We finally made our way up to him and I told him I wanted a hug for my birthday, he obliged and wished me a happy birthday. Tried to get a picture with him but the camera didn't want to cooperate. Then we stood back to just watch him work the crowd. He's amazing! He always making time for each person. Finally the crowd thinned out and he headed back down to the bus, the second man in black walking down a little dirt lane carrying his mandolin cases, I took a picture and hope it turns out it was really a neat sight. Next we head up to the "story telling stage." This is where artists come and tell stories on each other or themselves. It included Jerry and Tammy Sullivan, Marty, Allen Mills, and Tony Williamson, of the Williamson Brothers. Marty hadn't hardly sat down till he asked if anyone had a diet Mountain. Dew. It was rather humid and warm. Someone gave him a Sundrop which evidently did the trick. 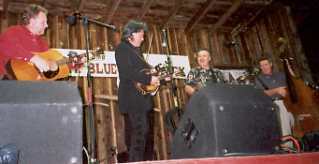 Allen started the conversation by asking about Marty performing with Lester, which led to several stories on Mr. Flatt. Jerry added some about Marty traveling with the Sullivans as a young man and Marty added in his comments. It was so funny to hear all these stories they were telling! Tammy recalled one time she was trying to get them set up for a show at a church in Philadelphia Mississippi. The preacher on the phone asked if "That boy from Nashville that wears those tight britches" was coming with them. She said she hesitated for a moment then said "No sir, he's not from Nashville he's from Mississippi." Good answer and Marty had a good laugh. He made the comment that it was really wonderful to be around bluegrass again and made an excellent point, that the music of today, the Faiths the Shanias and the other stars of today, their music most likely won't be around that long, but bluegrass music lives forever!! So true! He and Allen Mills performed "Send Me My Flowers While I'm Living" and did a wonderful job. Then he and Tony Williamson played "Rawhide" and "The Watson Blues". Marty played part of "The Watson Blues" on mandolin then took over on guitar and finished it out. He passed the guitar on over to Tammy and they played "Little Maggie" She's quite the talent on the guitar as well. As they were leaving the stage, someone asked Marty to end the show like Lester would have, so he did his impersonation of Lester and, if you had closed your eyes, you could have sworn Lester was still there! Afterwards, again, Marty was swarmed with people and he did the smiling, signing and posing again! He got twirled around so many times I'm surprised he didn't get dizzy. Mom and I decided to stand back and just people watch this time. We saw "Uncle Jug" sitting in the golf cart all alone so we went over and talked with him for a few minutes then he and Tammy headed back to the bus. The cart returned shortly with Bill Yates in the passenger seat, Bill is the former bass player for The Country Gentlemen and had come to take in the show. He climbed on the back of the cart to make room for Marty and they still had to wait for him. We talked with Bill for a moment and I told him it was great to see him there. He made the comment that Marty was having the time of his life and I think he was probably right! Marty went back in to get his mandolin cases and they headed off again. I went to buy a CD from Tammy between all the shows and told her Marty needed to do "Get Up John". She agreed and said he planned on doing it he just had to go over it some to refresh his memory. Time to head back to the stage for the second round of shows. Southern Junction was up first again, then The Williamson Brothers and The Lost and Found. As The Lost and Found were performing, the mandolin player, my friend Dempsey Young, disappeared during one of their songs. He arrived back on stage with his fiddle case and opened it up so he could play us something on it. As he was getting the fiddle out, imagine our surprise when Marty came out and took up Dempsey's mandolin to play with them! I had gone back to my seat by this time and let me tell you I flew back to the front of the stage for this, I had to have pictures. Dempsey had asked Marty while he was backstage if he would come out and play with them and he agreed! They played "Ragtime Annie" with Dempsey on fiddle and Marty playing the mandolin. How neat!! Dempsey was grinning from ear to ear and as they thanked Marty and he headed off stage Dempsey asked for a hand for his mandolin. Next up was the Bass Mountain Boys, the host band. They were great as well! They fired off a really fast song and, who comes out on stage again? You got it. Marty played two separate songs with them on his mandolin. He was having a ball and so were the bands, I think it just tickled all of them to get to play together. Now it was time for The Sullivan's second show, they did perform "Get Up John" and a song from their "Silent Witness" video, which I have yet to see, called "The Witness". I hope that's right!? This is going to sound funny but they really had the place "rockin" with their gospel music. It's just so powerful you can't help but feel the spirit. For their encore, they performed a song Jerry and Marty had written recently called "Pray". Tammy does the lead vocals on it and it's beautiful. 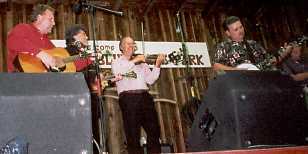 The last band was the very popular and talented Lonesome River Band. I'm proud to say some of those boys are from my "neck of the woods" also. We went back behind the stage again to see if Marty was outside and shortly after we got back there, he reappeared and the signing and hugging began again! I got back over and had a picture made since my camera failed the first time. We left while he was still pretty much surrounded, then shortly we saw him get into a vehicle and head out. 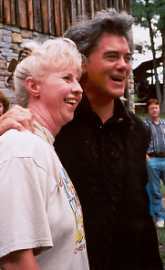 This was my first chance to see Marty at a bluegrass festival and I certainly hope it's not the last. I think everyone there enjoyed his performances VERY MUCH and would LOVE to have him back again. I'll look forward to it.